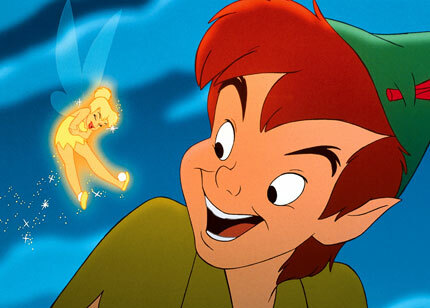 Peter Pan: Anyone Else Think Tinker Bell is Hot? Walt Disney had a group of nine animators who formed the core of his studio. They were Lee Clark, Marc Davis, Ollie Johnston, Milt Kahl, Ward Kimball, Eric Larson, John Lounsbery, Wolfgang Reitherman and Frank Thomas. They had worked on every animated feature film from Snow White and the Seven Dwarfs onward. Reitherman went on to direct Disney's animated feature films in the 60's and '70s, including successes such as The Sword in the Stone and The Jungle Book. This was their last film together as a group, so, in a sense, it is the end of classic Disney. Their departures may partly explain why the studio lost its way in the animation field between 1959's Sleeping Beauty and The Little Mermaid in 1989. Disney keeps this very up-to-date, in the US and abroad. They still were at work here for "Peter Pan" (1953), based on J.M. Barrie's 1904 play and 1911 novel, and the quality shows. In fact, it was basically the same crew from "Alice in Wonderland," with Mary Blair again handling the color and styling and Wilfred Jackson, Clyde Geronimi and Hamilton Luske directing. Walt Disney had put this on his list back in the 1930s, but he had trouble getting the rights. When he finally had them, World War II was in progress and this was one of the projects that he shelved in order to focus on war propaganda films. It took years after the war ended for the studio to recover, but when it did, Disney, put this back on the schedule. The setting is Edwardian London. George (Hans Conried) and Mary (Heather Angel) Darling have two young boys, John (Paul Collins) and Michael (Tommy Luske), and an eldest daughter, Wendy (Kathryn Beaumont). Wendy has been telling them stories that make them act up, so George bans her from the nursery and tells her it is time she sleeps alone in her own room. George and Mary then leave for a party. 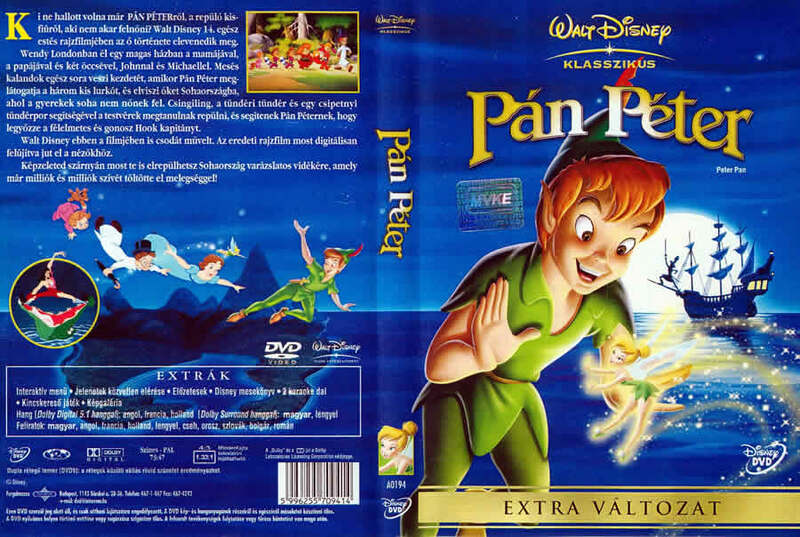 With the parents gone, the three children have two unusual visitors: Peter Pan (Bobby Driscoll), a boy with magical powers who never wants to grow up, and Tinker Bell (Margaret Kerry was the model, and Tinker never speaks), his cute little pixie sidekick, who Peter secretly loves. Peter visits because he knows the children believe in him and made him the hero of their nursery games. He takes them flying, then on a visit to a remote island called "Never Land." There, they see Captain Hook (Conried) and his timid, down-to-earth mate, Mr. Smee (Bill Thompson). 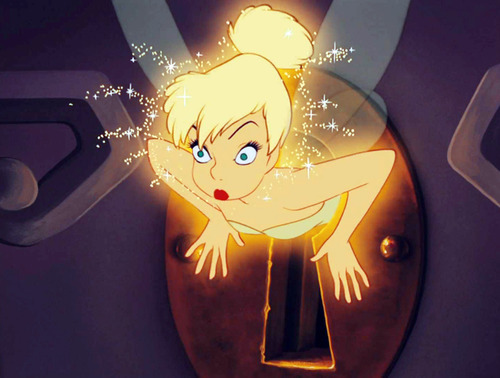 Tinker Bell through the key hole! Hook lost his hand to a crocodile and blames Peter Pan, whom he plots to destroy. 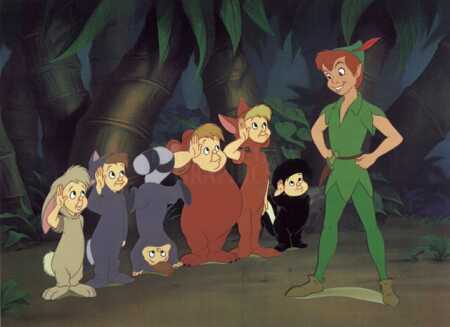 Peter Pan and the children visit the six "Lost Boys" (Robert Ellis, Jeffrey Silver, Jonny McGovern as twins, Stuffy Singer, and Tony Butala), who wear pajamas and follow Peter Pan. 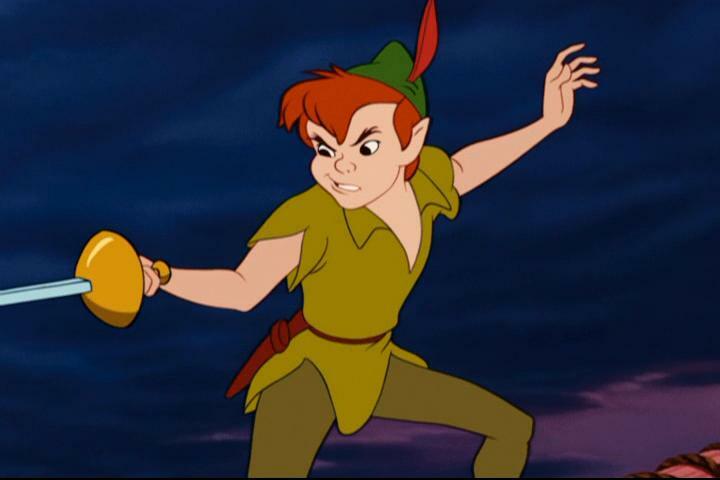 Tinker Bell turns out to be jealous of Wendy and tries to get the Lost Boys to shoot her down while flying, but Peter saves and then banishes Tinker for "high treason" until she redeems herself later. Hook has captured the local Indian chief's daughter, Tiger Lily (Corinne Orr), who he thinks knows the location of Peter Pan's hideout. John and Michael go with the Lost Boys to talk with "Big Chief" (Candy Candido), but instead Big Chief captures them, thinking they took his daughter. Big Chief gives Peter Pan until nightfall to return his daughter or he says he will burn his hostages at the stake. Captain Hook, at your service. Peter Pan and Wendy visit the local mermaids (June Foray, Connie Hilton, Margaret Kerry and Karen Kester), who love Peter but are jealous of Wendy and playfully try to drown her. Hook, arrives, though, and the mermaids are scared away. Peter Pan and Wendy see Tiger Lily being held captive, and they free her, making Big Chief happy. Hook finds Tinker Bell and tries to convince her to reveal Peter Pan's hideout, but Tinker Bell makes him promise not to hurt Peter Pan. He promises, but then proves his treachery by locking Tinker Bell inside a lantern. Peter giving Tinker a good shake. The Darling children decide to return home and invite Peter to join them, but Peter refuses to grow up. Hook captures the children and the Lost Boys as they try to leave, and try to blow Peter up with a bomb. 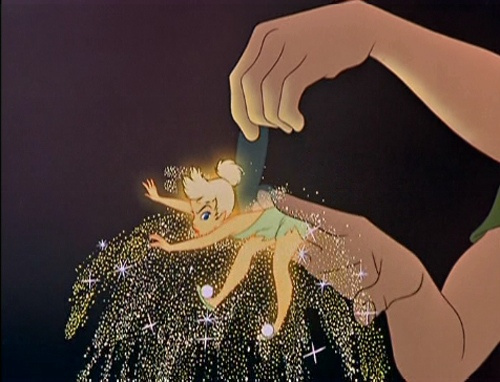 Tinker Bell, though, escapes and saves Peter just in time. 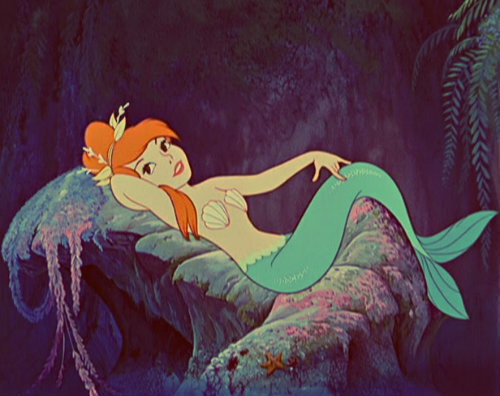 A lovely mermaid at rest. Peter and Tinker Bell then confront Hook and manage to free the children before Hook makes them walk the plank. Peter chases off the pirates and flies everyone back to London on the pirate ship. When their parents come home, the children have a tremendous story to tell, but will George and Mary believe them? Watch out for that... wall. This is a rousing story, with some great songs such as "The Second Star to the Right" and "You Can Fly" by Sammy Cahn and Sammy Fain, and "A Pirate's Life" by Ed Penner and Oliver Wallace. The animation is wonderful, with distinctive drawings of each of the characters that made them iconic. 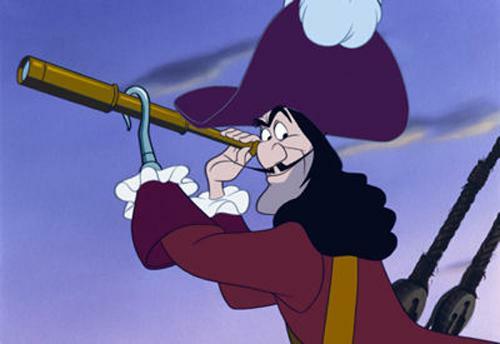 Hook, for instance, is drawn with a 5 o'clock shadow which helps define his character at first glance, and few animated characters are as distinctive as Peter Pan and Tinker Bell. 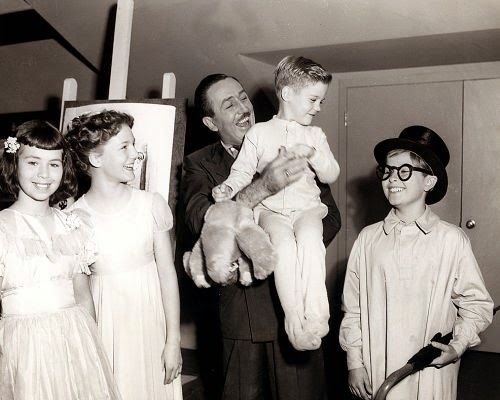 Walt Disney visits with the child voice actors. Live-action footage was used as guides, but not templates, for the characters. The animation of the characters flying is spectacular and seldom matched since, while the sword fight between Peter and Cook becomes a way to show how playful Peter can be and how ineffective Cook really is. 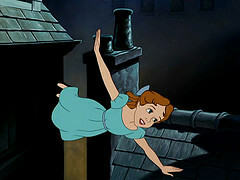 Tinker Bell's pique at Peter's attentions to Wendy is among the best in animation history. It is a sparkling production. Some small changes were made to the story mostly for technical reasons, but not enough really to notice. This has become the "accepted" version, and anyone who wants to read the novel to get the "real story" is always free to do so. Each of the Lost Boys gets a distinctive personality and is a treat, though the Native Americans are raw stereotypes, which may offend. In defense of the portrayal of the Native Americans, they were obvious caricatures played for laughs and as a comical threat, just as Hook and the Lost Boys were hyper versions of reality with prejudices against the Native Americans and girls and, well, just about everyone but themselves. As Big Chief notes, "Sometimes you win, sometimes we win," and Tiger Lily is portrayed as disdainful of these mere commoners and refuses to talk, so at least their honor and dignity is intact. If you want to be offended about something, there are a lot more important things to latch on to in life than this film. Cook is one of the iconic villains of film, reminiscent of Charles Laughton in Captain Kidd and the previous year's Abbott and Costello Meet Captain Kidd. 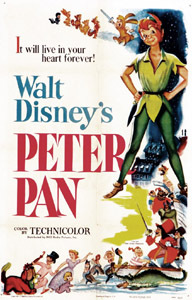 Peter Pan is invariably represented by his animated character in this film and is the prototypical mischievous little rascal. Wendy and Tinker Bell are terrific, human figures who finally learn to assert themselves through their adventures with Peter Pan. Tinker remains a favorite of many viewers even though she says nothing. The story is enchanting. What more do you want from one animated film? The Disney crew really was one big happy family at the time. Delightful schoolgirl Kathryn Beaumont from "Alice in Wonderland" the previous year was back again, and the reliable old crew was keeping things on track. Within a few years, Beaumont would be grown up and off to teach school as a career, and the nine animators would start peeling off in their own separate directions. 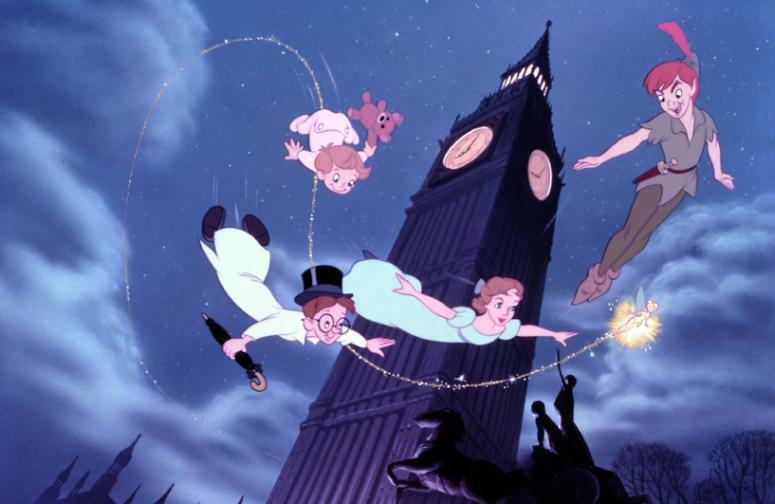 "Peter Pan" thus is a high point in the history of animation, and remains a favorite of children everywhere. It is the definitive version of the tale, with all due respect to Tim Burton. It is superior in every regard, and bears repeat viewings. The Diamond Edition DVD release (60th anniversary) was on February 5, 2012. Below is the "You can fly!" clip from the Diamond Edition DVD of "Peter Pan."